Your vacation object: The Holiday apartment is located in a farm (country specific category 3 stars, insgesamt 4 accommodations and 14 beds) and is surrounded by open garden property with flowers. The owner lives just temporarily in a separate building on the same property. 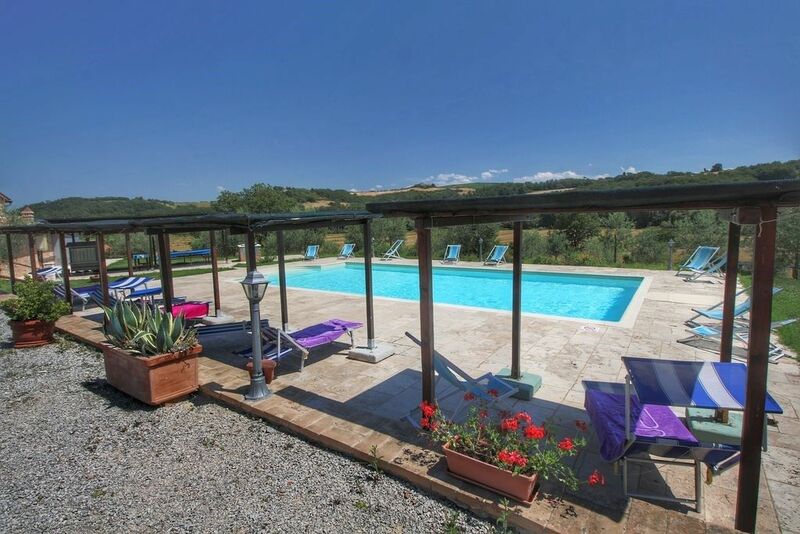 Comfortable furnished apartment with beamed ceilings and Terracotte - according to the Tuscan traditions. In the same house holiday apartment TOS SIN 143 are (3 people), TOSSIN144 (4 people), TOS SIN 145 (6 persons) and TOS SIN 146 (6 people). The court offers a parasol, garden furniture, barbecue possibilities and campfire place. For common use outdoor pool (9 m x 15 m, 1.5 m deep). Pool area is available from the beginning of May until the beginning of October. Your holiday apartment: Your holiday apartment offers 1 floor, 2 rooms (from which 1 bedroom), is 55 sqm and can accommodate up to 3 persons. On colder days your holiday apartment can be heated with central heating (gas). The entrance is on the ground floor and ground level and leads directly in the living room the kitchen living. The rooms are divided as follows: Living/bedroom with 1 additional bed at couch/sofa, fireplace, lounge, dinette and TV. You have access to the terrace with garden furniture, 1 table, 4 chairs and parasol. Bedroom with 1 double bed and 1 baby bed. Cooking nook as intersecting room and with TV, dishwasher, gas stove (4 burners), oven, exhaust hood, refrigerator (freezer) and coffee machine. You have access to the terrace. Bathroom with shower, 1 washbasin, WC and bidet. In addition, your holiday apartment is equipped with WLAN- internet access, baby bed, electric iron and washing machine. TV or radio channel can be received per satellite. Pets: nicht erlaubt. bathroom with shower, 1 washbasin, WC and Bidet.